Occupying the basement exhibition space of SEVENTEEN for seven evenings leading up to the opening night of the exhibition, Mike Harte and Jamie Shovlin will drink their way through seven different branded bottles of bourbon. 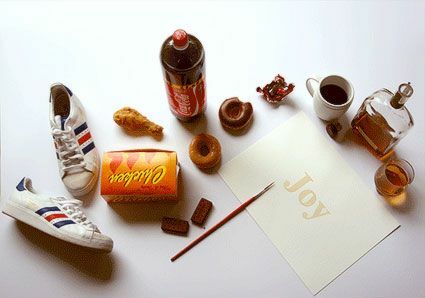 For each bottle consumed and each evening spent in the basement, Harte, using the very bourbon he and Shovlin are drinking as his medium, will produce a single painting of the word Joy. At the end of the week, and in perfect time for the private view, Harte will have produced a set of seven bourbon Joy paintings, all of which will be displayed in the ground floor gallery space over the duration of the show. These completed works will ascend in size in correspondence with the value of the respective brand of bourbon used to make them. The basement space, which will also be left open over the duration of the show, will remain exactly as Shovlin and Harte leave it following their period of occupation. --- The 'special-relationship' shared between Harte and Shovlin is a curious one. And while Bourbon Joy is in a way a fairly straightforward exhibition about friendship, drinking and art making - no part of this triad operates without device or condition. For a start, Shovlin will assume the role of magnanimous patron to Harte - his old friend and sometime collaborator - throughout the preparatory stages of the project. He will source the bourbon, provide art supplies, organise the framing of the final works and, most importantly, be on hand nightly to feed Harte alcohol - both as his sustenance and medium. While Harte alone will be doing the painting, the project will be fully co-authored; both Harte and Shovlin sharing full credit for the end works and the project as a whole. In this sense the trajectory of Bourbon Joy is proximal to previous projects authored independently by Shovlin in which Harte is tricked or coerced, for reasons of benevolent encouragement or simple exploitation, into making art (for example Mike Harte Make Art (2006) which featured a collection of letters sent by Harte to Shovlin that were never openly or intentionally meant to be art by Harte, their original author). One might begin to understand the particular conceit of authorship proposed by Bourbon Joy in terms of a certain division of labour that distinguishes the art-productive traits of the exhibitions respective co-authors. Shovlin is in many ways an 'over-producer', an artist whose productivity expands beyond the unitary in order to happily co-habit other identities - be they fictional, real or invisible in their authorial pretence. In stark contrast to this, however, Harte struggles with the very conditions of his own artistic singularity. Historically he has had a problem with the idea of having and maintaining an art practice, leading to him to often refuse the nomenclatural identification of 'artist' when others apply it to him. And so, Harte and Shovlin's collaboration is an apotheosis of sorts that makes perfect sense in terms of their distinct capacities for artistic production. And then there is of course the drinking. Bourbon Joy toys with romantic associations between radical artistry and inspired inebriation. The idea of the radical artist as a human being struggling equally with art and alcohol - an idea concocted in both respects out of a greater myth of human failure - finds tragicomic obfuscation in the programme of curiously local relations underpinning Harte and Shovlin's engagement with each other in Bourbon Joy.